I wasn't in band in high school, but I was what you might call band adjacent. Most of my friends were in band (the vast majority of them clarinet players, the reason for which remains unclear to me, the clarinet not exactly being the sexiest instrument in the band, or even the wind section for that matter). I was a motivated but only marginally talented violin player for six years, the quintessential first chair of the second violin section. And despite an awkward stage presence and a tendency to forget lyrics to solos, I was in as many choirs as they'd let me join. If you were a music nerd in high school, if the remnants of the experience led you to watch Glee until it collapsed under its own weirdness in about season three, if you can't quite bring yourself to sell that old trumpet to your friend's nephew even though its major activity for the past ten years has been to cultivate a layer of dust in the closet, then reading Kate Racculia's Bellweather Rhapsody will feel like coming home. It's November 1997, and the once-grand Bellweather Hotel in rural New York is readying itself for the annual onslaught of high school musicians and their teachers: it's time for the Statewide music festival. Among the talented participants are twins Alice and Rabbit Hatmaker. Alice will be singing in the choir and generally making herself the center of attention whenever possible. Rabbit (real name Bertram) plays bassoon and has landed the first-chair seat in the orchestra, though his mind is occupied with plans to use the weekend away to finally tell his sister he's gay. Chaperoning the twins is their young but already jaded teacher Mrs. Wilson, who has problems and distractions of her own. Things fall apart almost immediately upon the Hatmakers' arrival at Statewide. Rabbit is publicly and personally challenged by the crotchety, possibly insane Scottish orchestra conductor. Alice sees a girl hang herself, but the body disappears before anyone else has seen it. No one believes Alice that something has gone horribly wrong, but when she finds out her room was the scene of a murder-suicide exactly fifteen years before, that's enough to convince her. Meanwhile Viola Fabian, the director of Statewide and a total sociopath, makes enemies of nearly everyone in the hotel, even the dodderingly charming concierge. 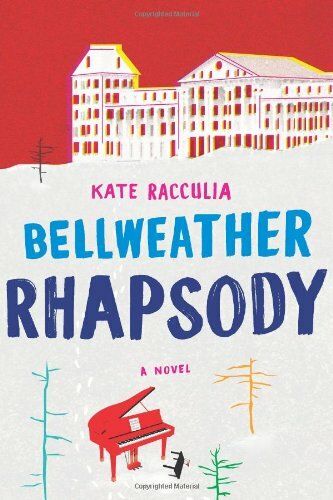 A little dark, a little wicked, and a lot nostalgic (for me, anyway), Bellweather Rhapsody perfectly captures the wackiness and warm-heartedness of musicians young and old. An absolute delight.